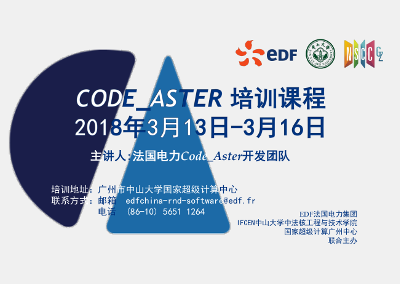 From March 13th to 16th, EDF is organizing in Guangzhou a code_aster training open to all, jointly with the Sun Yat-Sen university and NSCC-GZ (National SuperComputer Center GuangZhou). The courses will be lectured by engineers from the EDF R&D center in China accompanied by a code_aster developer and a professor from Sun Yat-Sen university. It will cover both basic functionalities as well as some advanced functionalities in dynamics and fracture mechanics. More information in the flyer below.